Have you seen a great image or video somewhere that you think would make a great APOD? Nominate it for APOD! Please post as much information here as you have about the image/video with a link to any source(s) for it you know of here, and the editors will take a look. When posting the image itself, please do not post anything larger than a thumbnail here; please honor the copyright holder's copyright. Please keep hotlinked images under 400K. Milky Way and the Summer Triangle over Stonehenge - still in the blue hour. Last edited by Sebastian Voltmer on Mon Dec 03, 2018 2:01 am, edited 2 times in total. This image, from the NASA/ESA Hubble Space Telescope’s Advanced Camera for Surveys (ACS), reveals thousands of globular clusters lying at the core of a galaxy cluster. 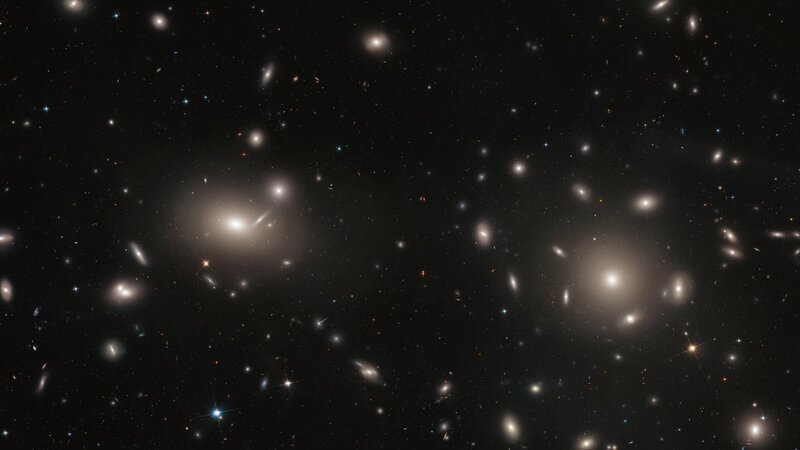 It was created by a Hubble survey that drew on data from three of the telescope’s separate observing programmes to explore the centre of the Coma cluster, a huge gathering of over 1000 galaxies, about 320 million light-years away, all bound together by gravity. 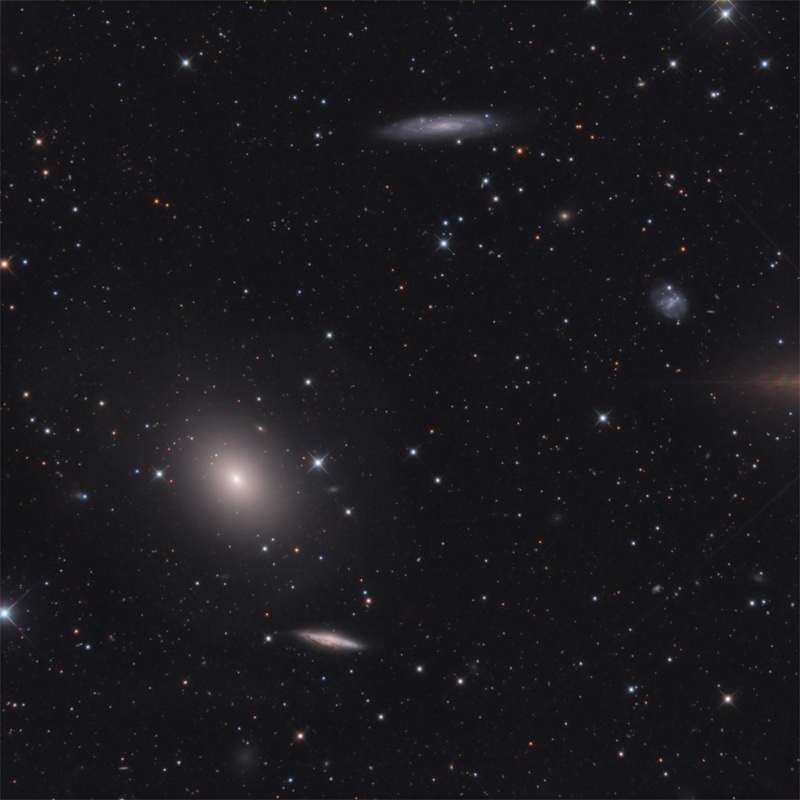 Astronomers spotted over 22 000 globular clusters, some of which had formed a bridge connecting a pair of well-known interacting galaxies (NGC 4889 and NGC 4874). A globular cluster is a spherical group of stars that usually orbits a galaxy as a self-contained satellite. However, the globular clusters studied here are of a different type, intracluster globular clusters. Specifically, these are globular clusters that are not bound to an individual galaxy, but to a galaxy cluster — in this case, Coma. While globular clusters orbiting our Milky Way reveal themselves as sparkling spherical assemblies of densely packed stars, at the distance of the Comla cluster, they only appear as tiny dots of light, even to Hubble's advanced vision. However, a characteristic feature of globular clusters is their colour; since the stars in any given cluster all formed at around the same time and from the same “stuff”, they usually have a consistent colour. In this way, the astronomers were able to identify the clusters — and rule out background galaxies lying in the same region of sky — by analysing their colour and size, painting a beautiful family portrait of Coma and its clusters. With the help of the identified globular clusters astronomers can map the distribution of matter and — even more important — of dark matter in the Coma cluster. 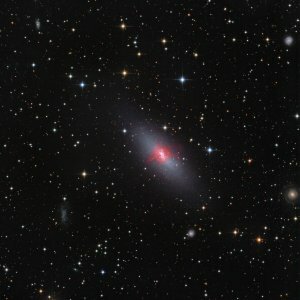 The Coma Cluster was one of the first places where observed gravitational anomalies indicated the existence of dark matter. This spectacular Picture of the Week was produced from data gathered by the Atacama Large Millimeter/submillimeter Array (ALMA) in Chile, combined with data from the NASA/ESA Hubble Space Telescope. 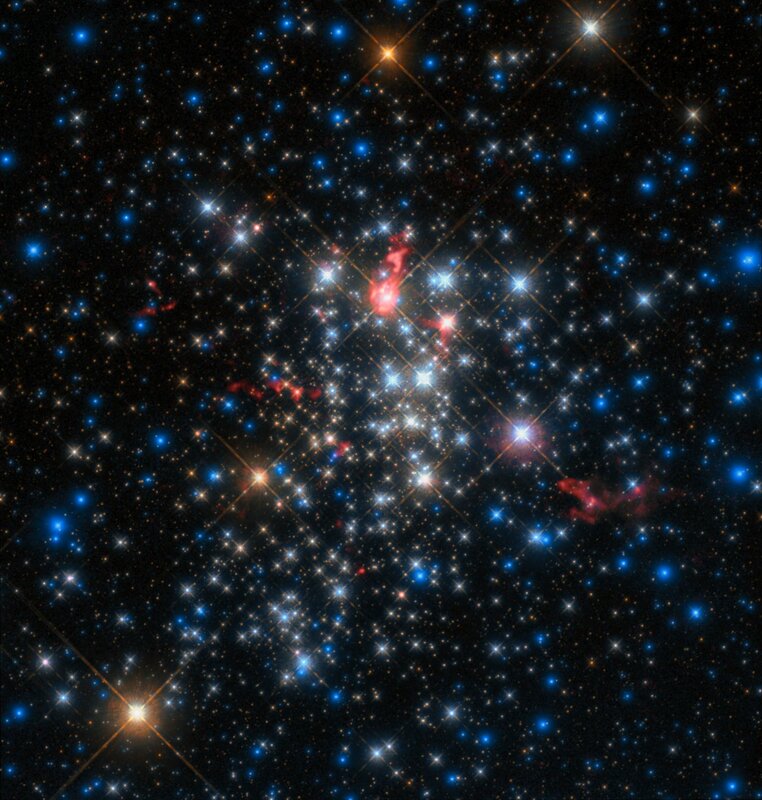 It shows a cluster of stars named Westerlund 1, one of the most massive young star clusters known to reside in the Milky Way. Excitingly, it also shows the comet-like “tails” of material stretching away from some of the giant stars in Westerlund 1. Such tails are formed in the thick, relentless winds that pour from the cluster’s stellar residents, carrying material outwards. This phenomenon is similar to how comets get their famous and beautiful tails. Comet tails in the Solar System are driven away from the nucleus of their parent comet by a wind of particles that streams out from the Sun. Consequently comet tails always point away from our Sun. 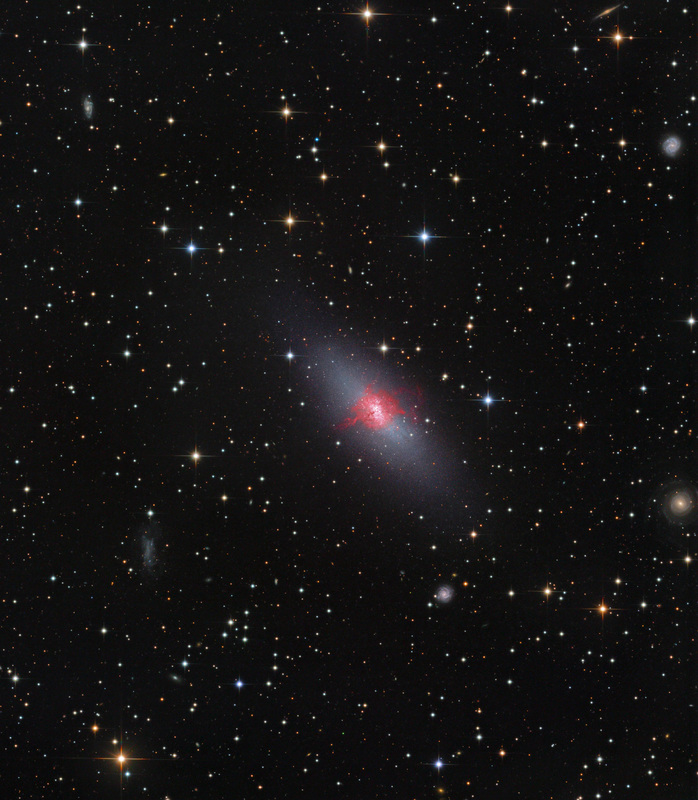 Similarly, the tails of the huge red stars shown in this image point away from the core of the cluster, likely the result of powerful cluster winds generated by the hundreds of hot and massive stars found towards the centre of Westerlund 1. These massive structures cover large distances and indicate the dramatic effect the environment can have on how the stars form and evolve. These comet-like tails were detected during an ALMA study of Westerlund 1 that aimed to explore the cluster’s constituent stars and figure out how, and at what rate, they lose their mass. The cluster is known to host a large amount of massive stars, many of them intriguing and rare types, making it of great interest and use to astronomers wishing to understand the myriad stars in our galaxy. Even more intriguing is the fantastically shaped tail at about 4 o'clock. It seems to have come loose from the star that it used to belong to, unless the star it belongs to is the tiny little yellow thing in the middle of this almost dog-shaped tail. It's a fantastic and highly intriguing picture! Last edited by Ann on Tue Dec 04, 2018 3:07 pm, edited 1 time in total. This image was used in this scientific paper. That's a nice picture and an interesting paper! What we can see in the picture is a large, old and quite OIII-rich supernova remnant, remarkably dominated by OIII emission for its size and age. The bright-looking blue star at top is HD 39586, a star of spectral class A5IV, of apparent magnitude +5.9, of intrinsic magnitude +1.25, making it some 26 times brighter than the Sun in optical light, and with a B-V index of +0.14. Unfortunately, I could only find this tiny version of Johannes Schedler's picture that was small enough to post here. NGC 5253 is an amazing core starburst galaxy. 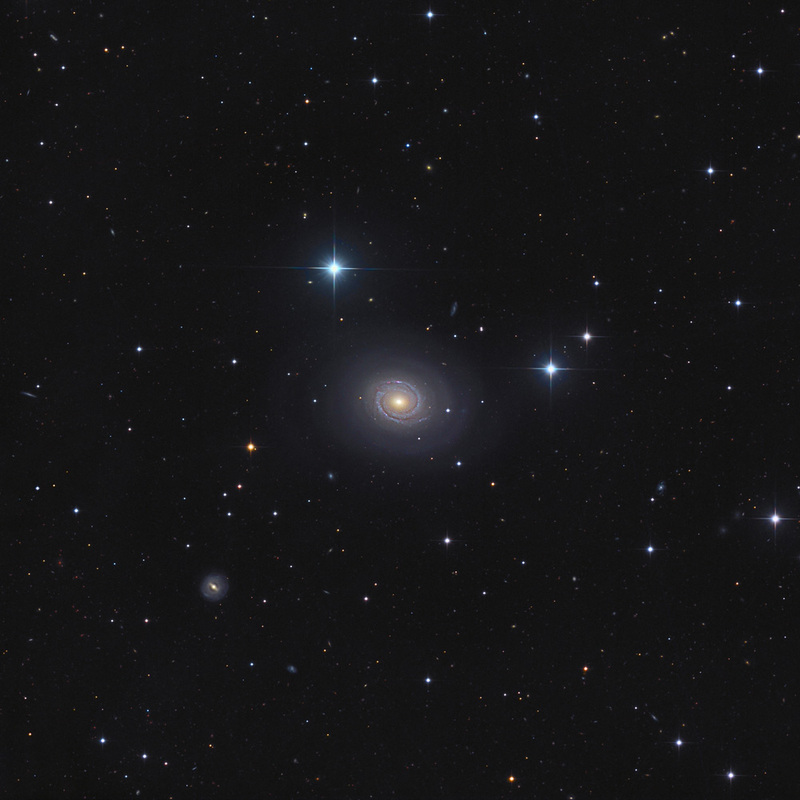 Johannes Schedler's image captures the galaxy's double nature perfectly: There is an oval dwarf elliptical "body" and a starburst, ragingly Hα-bright heart. P.S. Oh, sorry! You have already posted a better version av this image, haven't you, starsurfer? 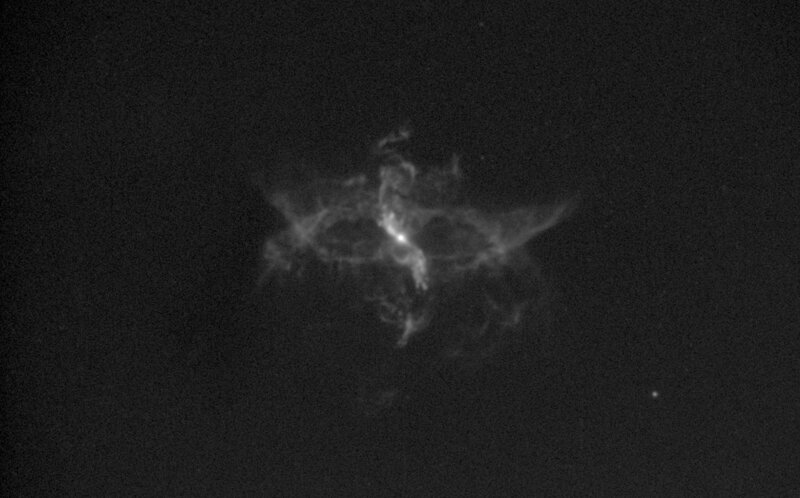 The R Aquarii system is a symbiotic binary star surrounded by a large, dynamic nebula. Such binaries contain two stars in an unequal and complex relationship — a white dwarf and a red giant. 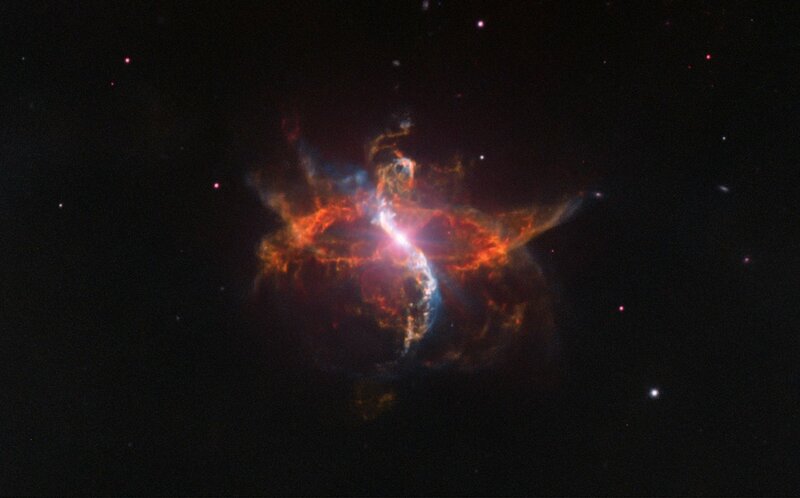 In a disquieting act of stellar cannibalism, the white dwarf is stripping matter from its larger companion. The tormented red giant and the unstable white dwarf occasionally eject matter in weird spurts, loops and trails — forming the curious shapes seen in these images. In this unusual comparison image — a rare case of dynamic evolution captured with ground-based telescopes — we see the difference 15 years can make. It may be the mere blink of an eye on a cosmic timescale, but it provides us with a wonderful opportunity to observe a truly dynamic system as it changes shape in our skies. These images show the evolution not only of R Aquarii, but also of our observational capabilities. The earlier view was captured by the Nordic Optical Telescope (NOT) on the island of La Palma, Spain — a 2.5-metre telescope. The image from 2012, on the other hand, was captured by ESO’s 8-metre Very Large Telescope (VLT), and reveals far more intricate details of this fascinating symbiotic star. This comparison image is the first installment in ESO’s R Aquarii Week, during which we will explore this intriguing object and its evolution. We will reveal the dramatic and ever-changing nature of R Aquarii, showing how it has evolved and expanded over years of observations. 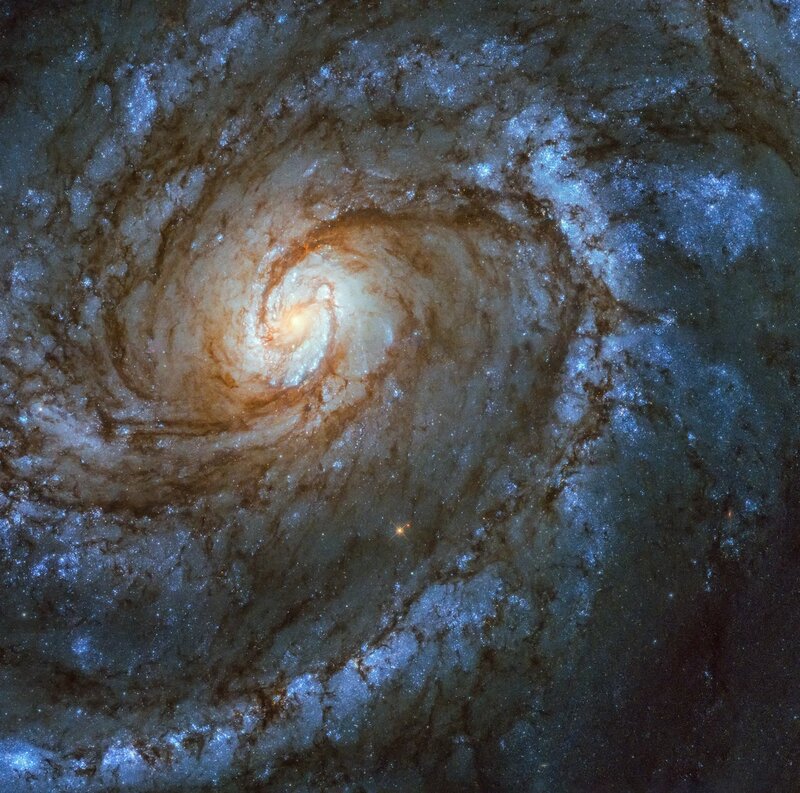 This stunning spiral galaxy is Messier 100 in the constellation Coma Berenices, captured here by the NASA/ESA Hubble Space Telescope — not for the first time. Among Hubble’s most striking images of Messier 100 are a pair taken just over a month apart, before and after Servicing Mission 1, which took place 25 years ago in December 1993. After Hubble was launched, the astronomers and engineers operating the telescope found that the images it returned were fuzzy, as if it were out of focus. In fact, that was exactly what was happening. Hubble’s primary mirror functions like a satellite dish; its curved surface reflects all the light falling on it to a single focal point. However, the mirror suffered from a defect known as a spherical aberration, meaning that the light striking the edges of the mirror was not travelling to the same point as the light from the centre. The result was blurry, unfocused images. To correct this fault, a team of seven astronauts undertook the first Servicing Mission in December 1993. They installed a device named COSTAR (Corrective Optics Space Telescope Axial Replacement) on Hubble, which took account of this flaw of the mirror and allowed the scientific instruments to correct the images they received. The difference between the photos taken of Messier 100 before and after shows the remarkable effect this had, and the dramatic increase in image quality. COSTAR was in place on Hubble until Servicing Mission 4, by which time all the original instruments had been replaced. All subsequent instrumentation had corrective optics built in. This new image of Messier 100 taken with Hubble’s Wide Field Camera 3 (WFC3), demonstrates how much better the latest generation of instruments is compared to the ones installed in Hubble after its launch and after Servicing Mission 1. Yes I've posted this in the past and the starburst nebula also has OIII emission. So good to see an image that shows all of it, such a fascinating object. I remember seeing the Hubble image of the core in the 90's.